The ideal time for your child’s first visit to our office is around the time of his or her first birthday. The first visit allows us to evaluate the development of your child’s mouth, review how to care for these new teeth, and help stop or prevent any harmful habits. Prevention and education in dental matters are two of the best treatments we can offer. We believe the best dentistry starts at home! Our staff is highly experienced and we work with children of all ages. We strive to make every visit to our office healthful, educational and enjoyable for both the child and the parent. We recognize that many adults have had or still have ‘dental anxieties’ and that sometimes those anxieties may be inadvertently or subconsciously conveyed to your child. To avoid this, we’ve outlined some pre-planning tips you as the parent can do to help both you and your child have a great experience at our office. Very young children don’t have a realistic sense of time. Wait until the day of the appointment to inform your child. Tell them you’re going to visit a tooth doctor who will count their teeth and teach them how to take care of their teeth. -We examine infants and toddlers while sitting on their parent’s lap in the dental chair. -If your child has a special toy or a blanket they rely on when they are anxious, please bring it to the appointment. We check teeth of dolls and stuffed animals, too, so if your child has a favorite one, please bring it! Most of our treatment spaces are in open rooms that make it easy for parents to be present while their child is being examined and to interact with the doctors and staff. We explain everything in an age appropriate manner so your child learns while having fun. At every exam we will review your child’s health history; take any necessary x-rasys; clean your child’s teeth (if any are present); conduct a thorough clinical examination of your child’s mouth, palate, gums, tongue, and teeth; and teach them about good food choices and how to brush and floss their teeth. 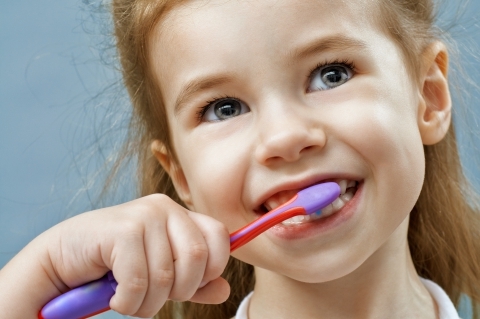 Prevention in children dentistry is the best treatment we can offer!